Receipt Paper, Paper, Thermal 82.5 MM (3.25") x 536" (8" outer diameter) Thermal Receipt Paper, Paper, Wound In, single roll. TSP1000/TUP500/TUP900 Printers. Also known as TRF-82-8. Receipt Paper, TRF-80-6. 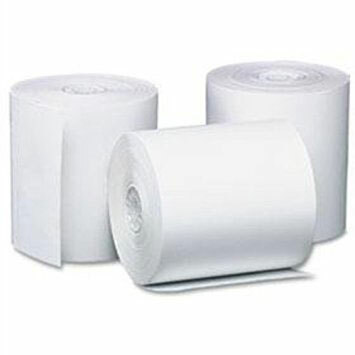 80 mm, 3.15" x 6", Thermal Roll Paper, Also available as a case (Part# 37996700). POS Paper, 80 mm, 3.15" x 6", Thermal Roll Paper, 8 rolls. Also available as a roll (Part# 37996700-R). Also known as TRF-80-6. Receipt Paper, 3.15" x 6" outer diameter Thermal Receipt Paper, 0.09 MM, single roll. Also known as TRF-80-6MG. Receipt Paper, Thermal Receipt Paper, 110 MM (4.4"WIDE x 6" DIA), FOR TUP900 Printers Only, single roll, 8 rolls/case. Also known as TRF-110-6. POS Paper, TRF-80-6. 80 mm, 3.15" x 6", Thermal Roll Paper, 4 rolls.